Towering above, Mount Pilchuck’s beetling summit beckons upward from the trailhead parking area, its square lookout shelter barely visible crowning its peak. Mount Pilchuck Trail, May 09, 2015. Mount Pilchuck’s rugged trail leads through thick, coniferous forest and across vast, open boulderfields (or snowfields, depending on the season) to a lookout on its summit, which, on a clear day, provides the quintessential Pacific Northwest vista: Washington Cascade peaks stretching from Mt. Baker to Mt. St. Helens, Puget Sound, the Olympics, and the emerald lowlands between. The trail begins benignly enough, but continues to steepen as it climbs to its final scramble at the base of the lookout. It is also rocky throughout, snowy from autumn through spring, wet at the upper elevations during the annual snow melt, and frequently windswept at the peak. Be prepared with appropriate gear for traction, stability, and warmth and check trip reports for current conditions at the Additional Trail Info link above before setting out. Nevertheless, it is also a well-used trail: expect the company of other hikers along the way and in the lookout at all hours, as it is not uncommon for some to brave chilly overnights in the shelter to witness the compass-spanning sunsets and sunrises this lofty vantage affords. Impressive views begin at the trailhead’s parking area, where the gaze sweeps over the South Fork Stillaguamish River Valley. Mount Pilchuck Trail, May 09, 2015. For approximately its first mile/1.60 km, the trail passes through heavy coniferous forest. Mount Pilchuck Trail, May 09, 2015. The trail is consistently rocky throughout, including where it crosses Rotary Creek by stepping stones not far from the trailhead. Mount Pilchuck Trail, May 09, 2015. 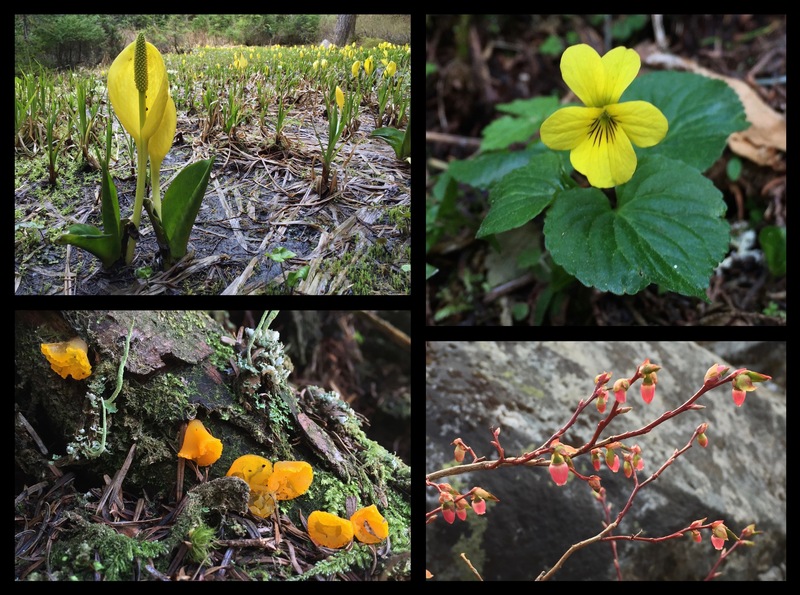 Few wildflowers grace Mount Pilchuck’s rugged trailside. Near the trailhead, skunk cabbage (Lysichiton americanus), so named for its distinctive scent and large, waxy leaves and also descriptively known as swamp lantern, lights a wayside bog with malodorous tongues of floral flame (upper left). In the dense woodland, look for violets (Viola sp.) (upper right) and tiny, luminescent orange jelly fungi “blooming” directly from decaying wood (lower left). Near the treeline, balloon-like blooms of huckleberries and blueberries (Vaccinium sp.) brighten the wayside with rosy precursors of fruits to come (lower right). 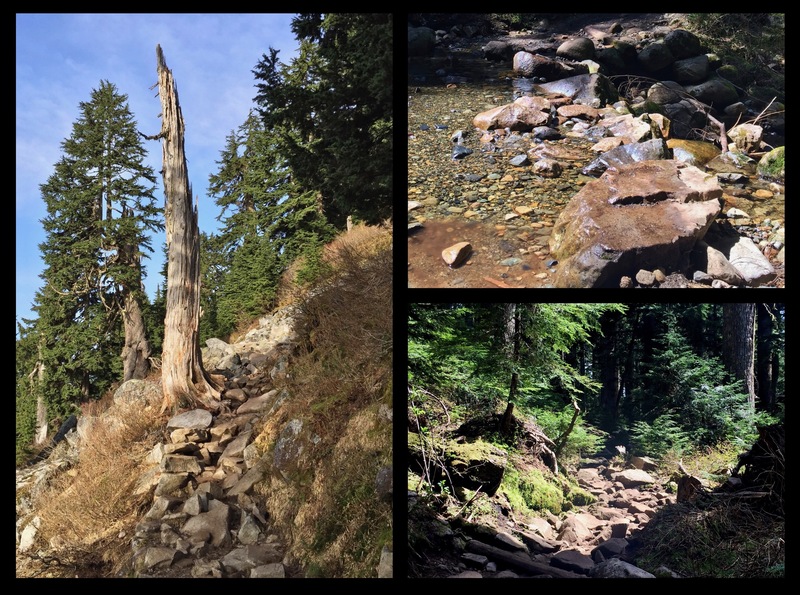 Mount Pilchuck Trail, May 09, 2015. Upon clearing the forest, expansive views begin immediately. At its distant outpost, Mt. Baker remains a constant sentinel on the northern horizon. Mount Pilchuck Trail, May 09, 2015. Above the treeline, the stars of the increasingly panoramic view are snowy Three Fingers, flanked on the left by Whitehorse Mountain and on the right by Big Bear Mountain and Liberty Mountain. 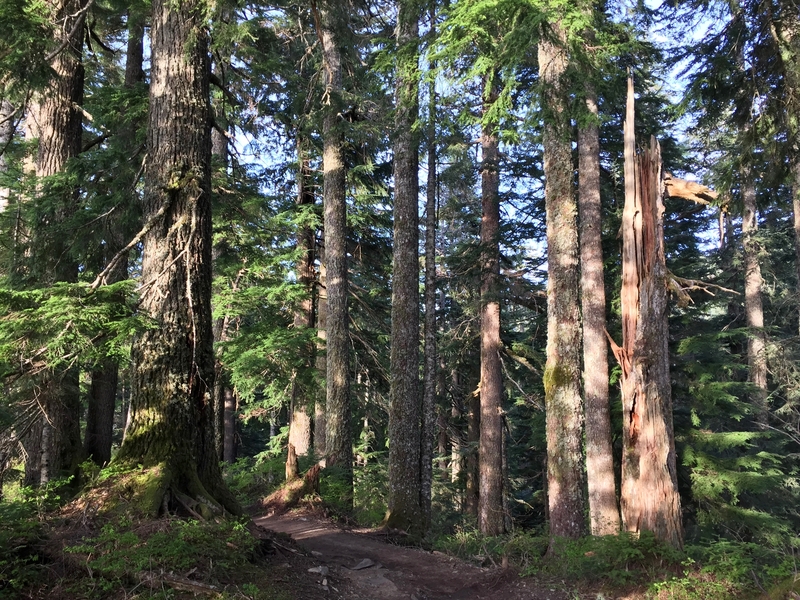 Mount Pilchuck Trail, May 09, 2015. The trail veers upward toward Mount Pilchuck’s summit before arcing around and approaching it from behind. Mount Pilchuck Trail, May 09, 2015. Rounding the summit, the trail picks its way through piles of ever larger boulders, including one knife-edged monolith standing perfectly upright beside the trail as if set by human hand. Mount Pilchuck Trail, May 09, 2015. Near the summit, Mount Pilchuck arches its crinkled spine. Mount Pilchuck Trail, May 09, 2015. The final ascent is accomplished by scrambling up the heap of boulders about the base of the lookout. Topping Mount Pilchuck at 5,327 feet/1,624 meters, it was constructed in 1921 as one in a network of fire lookouts along the Cascades. The lookout was retired from service in the 1960s, but is maintained as a shelter for hikers, as the windswept summit can be chilly on even sunny days. Mount Pilchuck Trail, May 09, 2015. An unbroken 360-degree view unfurls from the summit. To the north and east, the panorama encompasses, from left to right, Mount Shuksan, Whitehorse Mountain, Three Fingers, Big Bear Mountain, Liberty Mountain, and Whitechuck Mountain. Mount Pilchuck Trail, May 09, 2015. Beyond Mount Pilchuck’s eastern ridge, ice-clad Glacier Peak, oft-forgotten among Washington’s most volcanically active peaks, tops the surrounding Cascade host. Mount Pilchuck Trail, May 09, 2015. Southeast from the summit, the Cascades march beyond sight. On very clear days, Mt. Rainier and Mt. St. Helens are visible on the southern horizon. Mount Pilchuck Trail, May 09, 2015. Beyond Mount Pilchuck’s stony prow, Puget Sound sprawls into the western horizon. Mount Pilchuck Trail, May 09, 2015. The mountainside plunges precipitously from the safety of the lookout. Heather Lake and Lake Twentytwo lie in stony hollows far below Mount Pilchuck’s beetling northeastern ledge. Mount Pilchuck Trail, May 09, 2015. At trail’s end, dusk descends upon the South Fork Stillaguamish River Valley. 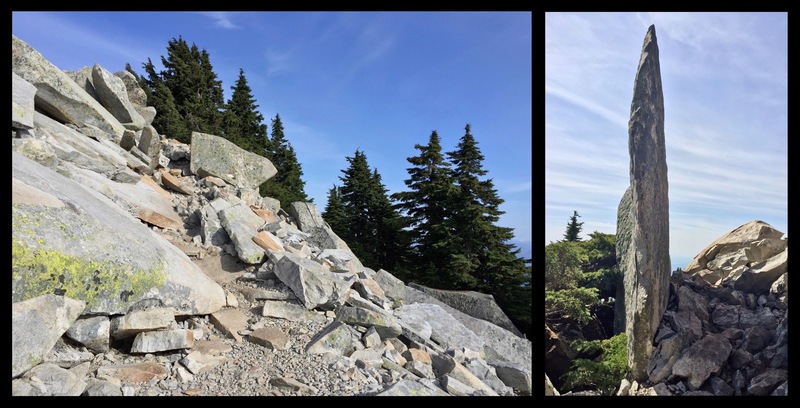 Mount Pilchuck Trail, May 09, 2015.